Please Note this group has been canceled until further notice. 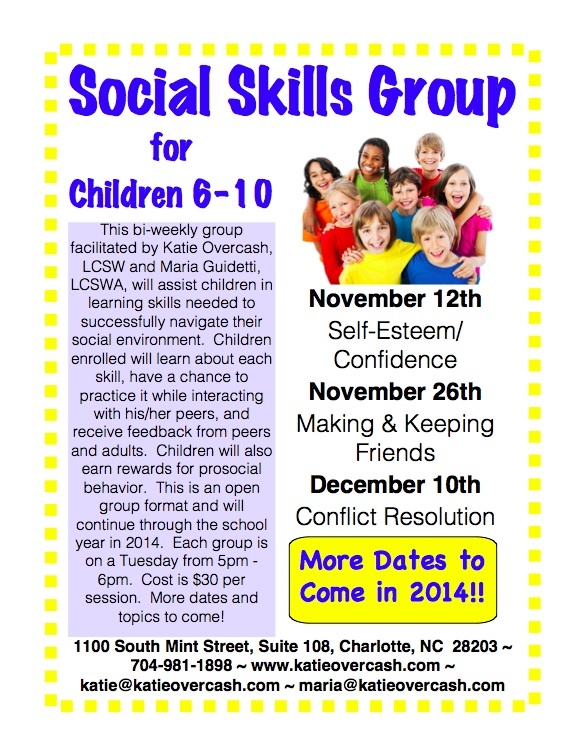 Katie Overcash, LCSW and Maria Guidetti, LCSWA are pleased to announce that the “Social Skills Group for Children 6-10” will begin on Tuesday, November 12th from 5 – 6pm. This biweekly group is an open group format meaning that children can come to sessions as needed. This group will help children obtain the tools needed to navigate their social environment while interacting with his/her peers. Katie and Maria will serve as facilitators as well as provide feedback and model appropriate behaviors. Each group will be held at Overcash Therapy Services (1100 South Mint Street, Suite 108, Charlotte, NC 28203) from 5pm until 6pm. Cost for each session is $30 payable by cash, check, or credit card. Parent consults with one of the therapists will be conducted once every 2-3 months and are optional in nature. They will last 30 minutes in person or by telephone and cost $20 to serve as a way to communicate about participation in group. Group will continue through the school year in 2014. More dates will be available! How do I know if this group is appropriate for my son/daughter? Children who attend this group have exhibited some difficulty in their social environment such as trouble expressing feelings, low self-esteem/confidence, struggles interacting with friends or peers, and difficulty making decisions, taking responsibility for actions, or resolving conflict. History of aggressive behavior will not be permitted to ensure the safety of all. My child has a diagnosis that falls on the Autism Spectrum. Is this group appropriate for him/her? Historically, this group has been effective for children who are diagnosed with High Functioning Autism. The skills addressed in this group go beyond the basic social skills, therefore children enrolled need to have mastered them in order to receive the full benefit of what is presented. My child is 5(or 11) can he/she still participate? This group is developed and activities are tailored for children in this age range and can only admit ones between 6-10. Can my child contact another child outside of group? This group is not set up to restrict outside contact. However, if outside contact interferes with the therapeutic process, it will be addressed with the parents. What if my child cannot make it to every session? Your child is not required to attend every session. The group is set up as an open format and attendance can be based on scheduling, topic addressed, etc. The more sessions your child attends, the more practice he/she will have with these skills. Will my insurance cover group costs? Unfortunately, insurance will not cover this group. However, you are welcome to use a Health Savings Card to pay for sessions or cash, check, or credit card. Cost is $30 per session and parent consults are $20 for 30 minutes. How will I receive updates from the therapists on my child’s participation? Parental consults will be offered every 2-3 months for 30 minutes in length. They can be in person or on the telephone. Any other information that is needed from the parents will be given to therapists prior to group or through email as situations arise. What will a typical group session look like? Group time is divided into 3 sections: 1) An interactive group discussion introducing and learning about the topic, 2) An activity where your child will be paired up or in a small group to work on an assignment, play a therapeutic board game, create a role play, etc, 3) Points and Feedback where your child will discuss his/her own behavior, provide and receive feedback to/from peers, and receive feedback from staff. If time allows, unstructured interactive play will be provided at the conclusion. What if my child cannot stay the entire length of time? We ask that all group members attend the entire group session as to not disrupt the flow of group and benefit fully from what we are learning. If on occasion, your child needs to come late/leave early, it will be allowed. Please click on this link here to sign your child up. Once the form is submitted, you will be contacted by either Katie or Maria to submit paperwork. Please sign your child up before the first session he/she will attend. This entry was posted in Uncategorized on September 9, 2013 by katieovercash.